Everyone is welcome to join us for Food, Music, and time with friends. 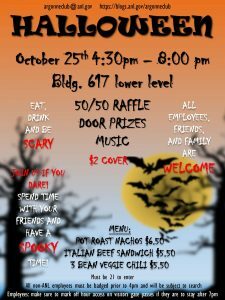 Open to all employees, friends and family. $2 cover charge. Wear your best costume and get in for free. Sodexo will have food and drinks available for sale. 50/50 raffle and door prizes.